Asasku Blog* Delta Edition: いらっしゃいませ! That was the first greetings that startled me for awhile as I entered the grand opening of a Japanese Restaurant in a Japanese Mall, located within this university - satellite town, suburbia. To an everyday Japanese Restaurant goers, Yu might have been accustomed to this ritual. But, for a student with a tight budget, this will be the closes I could get to experiencing Japanese culture. And later, I've realized that it's not just me who were startled, but to almost all the first time customers who entered. From the excitement and highly spirited restaurant staffs (locals who lived nearby this suburbia mall) on their first day opening and perhaps highly inspired by their supervisors speech early in the morning. This will be the first time for any customer, me included (who also lived nearby this mall) to be greeted once entering a food premise. Ironically, yu couldn't get the same greetings if yu go to any local restaurants or stalls in this suburbia, even if the same staff were working over there. 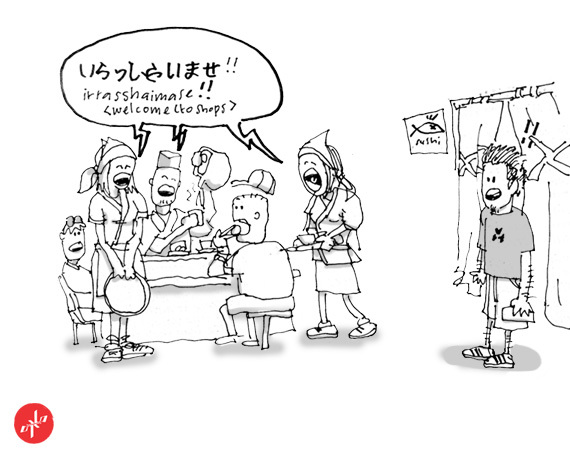 "Back In My Early days"
Are greetings the customer are a new business method to the locals? I beg to differ, as I remembered the experience in having breakfast whenever I went back to my Kampung, where "everyone knew everyone". Did something happen in the transition in between our migration from rural to an urbanize environment? Where we become less friendly, due to the 'temporary moments' we shared in this ever changing spaces. We're somehow, (in the context of this suburbia) are all in a constant transition and in the moment of creating a new familiarities and memories (like how we see our grandfathers romanticizing their environment back in their time). Is the introduction intervention of a foreign culture premises could help local restaurants to be more 'welcoming' to their patrons other than a cold shoulder with a 'what yu want for food?' look, or vice-versa? I would like to believe that it will be an added value to the patrons experience, but I do preferred to experience it in my local favorite eating place around this suburbia as well, where i feel that it will be a 'natural expression' (because we know where each other lived) and not by a fake greetings due to the company policies - 'must greet the customer with a smile'.